Yes, you heard that. This (Caucasian) lover of all Asian foods has made a lovely little salad, inspired by a recent trip to the Korean Market. Which you know is where I live, right? I mean I’m probably there like 3-4 times a week. The old Korean ladies stare at me like I’m an alien while the Latino employees stare at me because they’re shocked I’m not Korean. Plus I have cute hair. And I actually smile at people. That’s a rare site in the Korean market, let me tell you! It’s like everyone is eagle-eyed on the cabbage and can’t even look up to acknowledge their fellow human beings. So, as the giver that I am, I try to actually smile at people and ask the check-out lady how her day is going. Because it doesn’t appear to be going very well. Back to the salad. Because that’s why you’re here. 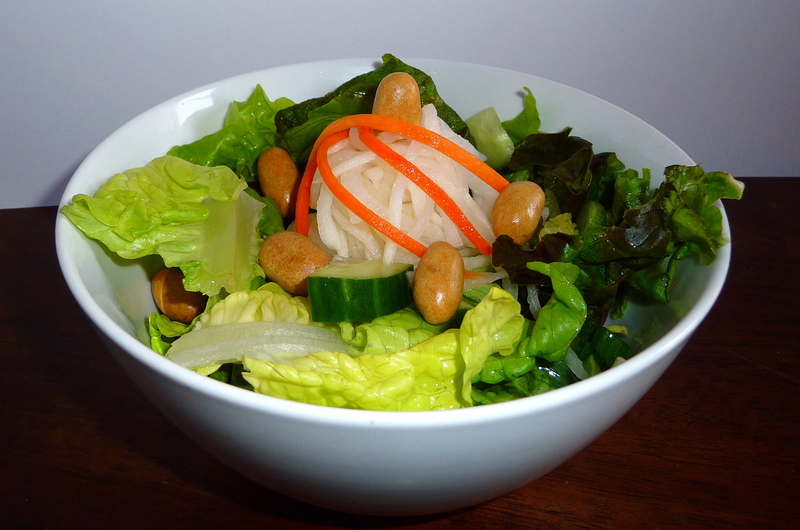 Basic red leaf lettuce topped with chopped scallions, cucumbers and Japanese peanuts. Crowning glory: the pickled radish salad bought (prepared) from said Korean market. It’s tangy and vinegar-y and I’m damned if I can replicate at home. I’m sure there’s like a million pounds of MSG hidden behind “natural seasoning” but I’ll pretend I don’t know that. If you’ve never had a Japanese peanut, I highly recommend them. They’re sold at pretty much any Asian market.Basically its a regular peanut covered in a wheat flour / rice flour / sugar / salt / soy sauce mixture that creates a thick coating. They have a crunchiness to them that’s really lovely, with a slight soy-peanut-umami flavor. Great to snack on or, in this case, on a salad. Now, to the dressing! This dressing only has like 10,000 ingredients. Kidding…almost. Dressing recipe after the jump. NOTE: And by the way, the salad is not pictured with said dressing because said dressing looks like a white creamy mess. Also, do you really think my entire lunch was just this tiny little salad? Ha! I attacked a bowl of this stuff that was probably larger than my head. Note: feel free to play with these ingredients to suit your taste. Also, this recipe makes about 1 cup of dressing, so be prepared to eat it for the next few days. Blend all ingredients in a food processor until combined. Taste to see if it’s the right balance of sweet / salty / savory for your taste buds. When adjusting the flavoring, do so in small amounts (maybe 1/2 tbls. at a time) so you don’t overdo it with any one flavor. The result is a really creamy, not too salty Asian style dressing. Great on a salad like this or over steamed vegetables.